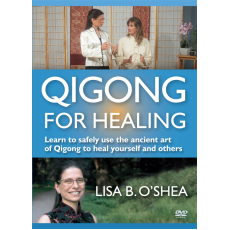 In this video, Lisa B. O'Shea will teach how to do the hands-on medical Qigong healing work that she has been using to help people since 1995. You will learn how to do a Qi Healing session on yourself as well as how to perform this on a partner. Lisa also teaches the Dantian mediation and some of her Rising Lotus Medical Qigong form that has been specifically optimized for self-healing. She explains the theory of energy development in the body, the basic differences between western medicine and traditional Chinese medicine, and how to safely cultivate your own energy. This DVD was filmed with YMAA Publishing, the publishing company her teacher, Dr. Yang, Jwing-Ming, founded. You don’t need any previous experience with Qigong to benefit from this video. Learn to clear stagnant energy in the body to resolve physical, psychological and emotional issues at their energetic roots, and stimulate the body’s energy channels to heal yourself or a partner. Learn excerpts from the highly effective Rising Lotus Medical Qigong form that have been specifically chosen for self-healing. The Qigong on this video can be practiced by people of all ages, and requires no prior experience or special abilities. A little practice each day can result in a profound improvement in your health. Watch a clip from the Qigong for Healing DVD on Vimeo. Lisa's bio from the Qigong for Healing DVD on Vimeo.